First Caroline and I, Antony and Alan (Gold) had the trip up to Scotland – thank goodness for shared driving. 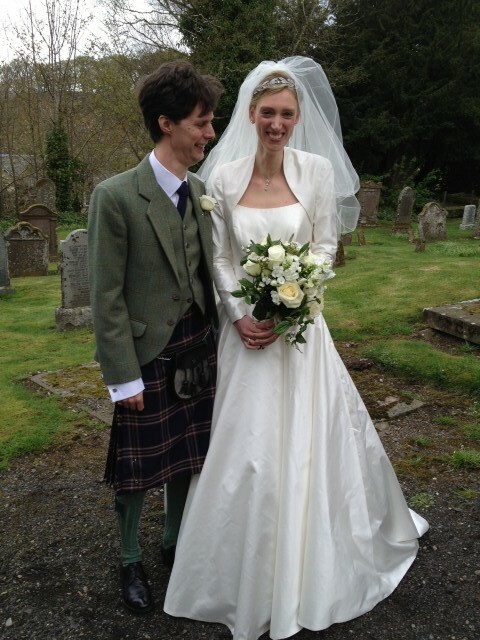 Alex (who does our PR) and David had a wonderful “fairytale” wedding at David’s home in Monzie Castle and in their own Kirk! – just for once Alex did not have her “PR” hat on, they both looked truly beautiful and happy, surrounded by lots of family and friends – not forgetting all the Dutch relatives who were just wowed and loved the castle and especially the ceilidh. Men in kilts everywhere! Ant and I then went on to stay with friends in Forfar – enjoyed Arbroath Smokies and saw nesting Puffins. Back to the fray and so many new properties popping up – in most unlikely places – Ceri, Ann, Lucy and I have been flat out – visiting new cottages, Lucy taking photographs with Ann behind her and I have been doing write-ups – then Ceri has the difficult bit getting them sorted out and then onto the brochure supplement sheet and the website thus leaving everyone else extra busy too. Last week we added 11 new properties to our portfolio in time for May Bank Holiday and Hay Festival – do take a look for last minute availability. Meanwhile Carolyn and I have been on “fox alert watch” from our chicken side window , bold as brass a large , looks like a dog fox, has been creeping up and snapping up our lovely fluffy hens and ducks – no wonder they have stopped laying. Almost one a day has been disappearing until we caught sight of him during the day making off with one of the Indian Runners ….there may be four dogs in the office but they are pretty useless!!! So this weekend we have numerous family all arriving for half term and Hay Festival – Brecon Beacons Holiday Cottages are sponsoring Alannah Weston talks to Dylan Jones – Business Breakfast on Friday 31st May at 9.00 – for goodness sake what on hour to start! We tried to sponsor Alannah talking with Lily Cole and Steve Trent about the use of sharks in the beauty trade but “pipped to the post” and rightly so, by The Environmental Justice Foundation. Alannah, who is a close friend of my daughter, is staying with us and they are godparents to each other’s children thus my interest and connection. I cannot say any of us here are exactly very fashion conscious but it will be interesting. 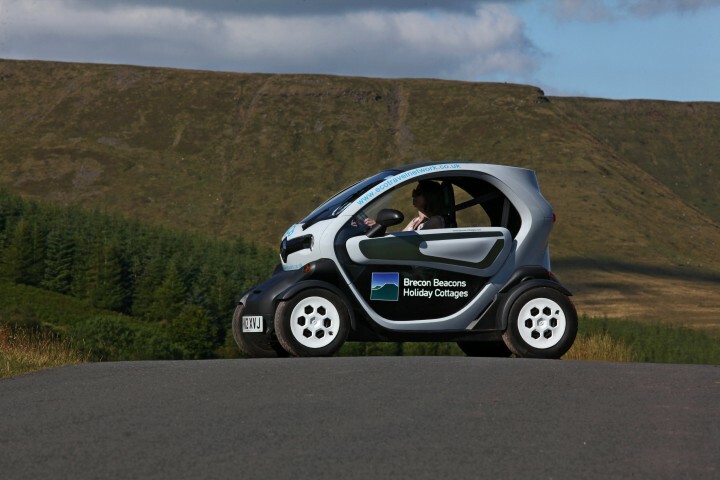 So Hay Festival here we come – the Festival Office is borrowing Tomas our Twizy to buzz around Hay and the festival site – good PR for us – we will be over there most days either for an event or meeting up with people. It is Emma’s birthday to-day – so Happy Birthday – lucky we had a cake and we have all had a jolly lunch in The Star – as usual very good pub lunch.